Sometimes we just need easy. Maybe you’re a home chef superstar who manages to raise two beautiful and put-together children, walk your dog every day, keep your house clean AND prepare healthy and delicious meals day after day. OR maybe you’re a bit like us. Both are fabulous! And both could sometimes use a recipe that is easy and delicious. Egg salad has been an American classic for decades, and there’s a reason why! You can make it as simple or decadent as you’d like. You can eat it on toast, or for our gluten-free friends, you can eat it on a lettuce wrap. Either way, egg salad is the perfect go to lunch. It’s easy to bring to work, to put in your kid’s lunch box or a grab and go dinner. Why not spice up your egg salad a bit with a little black garlic? 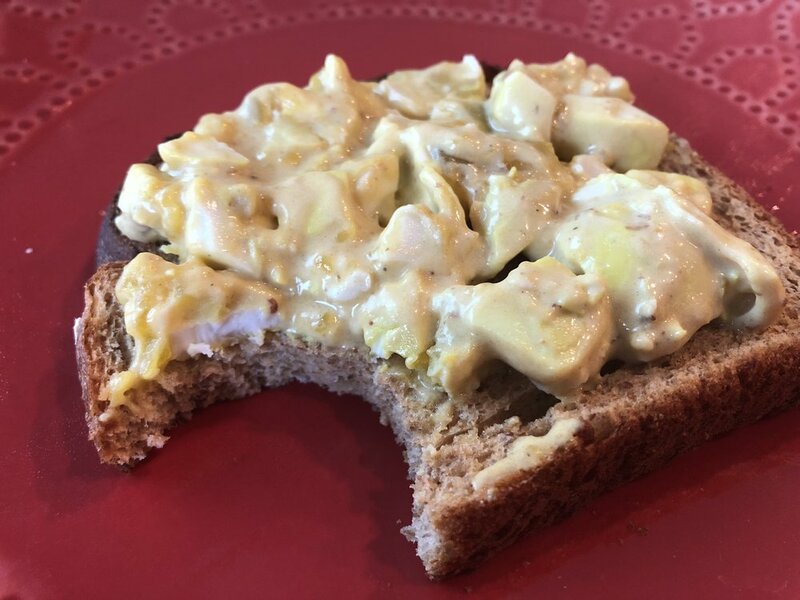 We used our homemade black garlic mayo (recipe below) instead of regular mayo while making the egg salad, but you can also smear a little puree on your toast before topping it with your egg salad or you can finely chop cloves and mix them in. If you go the black garlic mayo route, you may have some to use with your sandwiches all week! Whichever way you decide to add it, black garlic will give your egg salad an extra kick of unique, a bit of balsamic, and a whole lot of fun flavor that the whole family will love. Combine egg, dijon mustard and lemon juice in a jar jsut wide enough for the head of your immersion blender. Pour oil on top and wait for ingredients to settle before blending, keeping the head of the blender on the bottom of the jar. Slowly rotate the head around and up and down until the mixture is homogenous. Season to taste with salt. Whisk in black garlic puree and sriracha. Our favorite egg salad recipe is from Bon Apetit, just substitute the mayo above for regular! Happy experimenting!